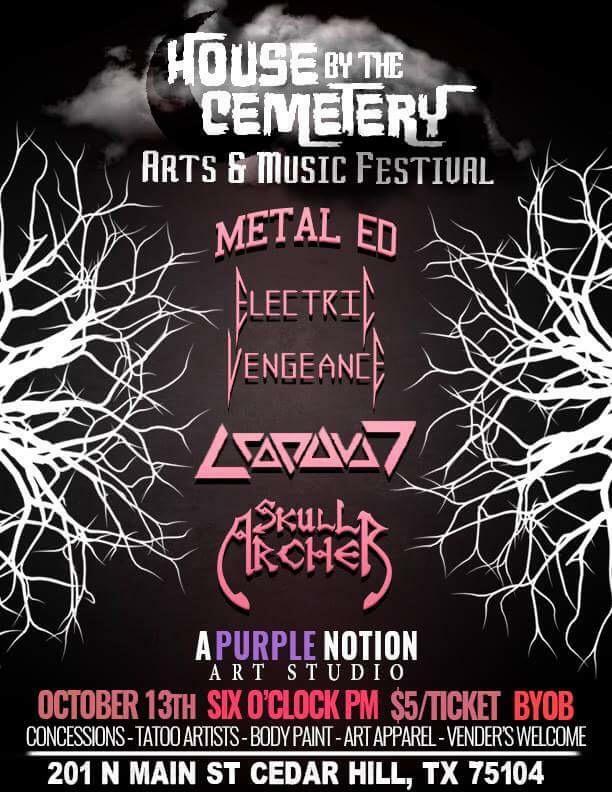 "Where Fun Art Meets Fine Art..."
Join us Saturday, October 13th from 6 Until... for an outdoor, heavy metal and art infused festival. Zina Martin of House of Zina will be hosting the most excellent Halloween art festival/concert at her art studio in Cedar Hill on Saturday, October 13! We have the bill of bands complete with Skull Archer, MetalEd, Electric Vengeance, and CROPDUST!! We are looking for local artists to be a part of the festival! We seek artists of all kinds: Artisans, Jewelry Makers, Ceramic Artists, Tattoo Artists, Vendors, Face Painters, Henna Artists, Marionette Makers, etc. If you are interested in being a part of the festival and showcasing your art, please message me or Zina for more details. Thank you! Limited Vendor Opportunities available. See our Artist Page for more info. A Purple Notion was birthed recently as an homage to what was and is affectionately known in Cedar Hill as "The Purple Farmhouse". It was a "historical home" for a private art studio that artist Kenna Prior realized and later transitioned ideas and dreams that blossomed into a creative space, re-imagined by Zina Martin of House of Zina. It is an art studio designed to bring the community, local artists, artisans and art enthusiasts of different genres together. Our desire is to have a social gathering place that brings a melange of Arts, Culture and Community based events to the heart of Cedar Hill. We invite local artists, musicians and art and culture enthusiasts to be a part of the vision in creating a social atmosphere of ideas, conversation, creation, community and conundrums. Welcome to an adventure of "Fine Art, Fun Art and the Curious". ​Join Creative Expressions wth Teya and House of Zina on Satruday, September 22 at 11 a.m. at A Purple Notion for a beautiful "En Plein Air" experience. Plein Air is french for outdoor painting. Classical artists were famous for this style of painting to capture the beauty of their outdoor subjects in natural lighting at different times of the day. Brunch and mimosas will be served in addition to live jazz and a few vendors as well. Join us for a new paint party experience. all with creativity at its core. Zina Martin, artist and designer, has long since dreamed of creating a social gathering place combined with the ambience of an art studio at its core. A Purple Notion answers that call for having a place to design and create in, bounce ideas off of like minded individuals and enjoy the "crafts" that local visionaries and artists have to present. This is also a fusion of Fine Art and Fun Art for the veterans and for those wanting to dip their toes into fun and creative night and days of creativity and entertainment.